You may have seen me on the latest episode of “There Goes The Motherhood”, kneeling in front of an altar and chanting what sounds like a strange alien song. No, I’m not invoking a witches spell ! 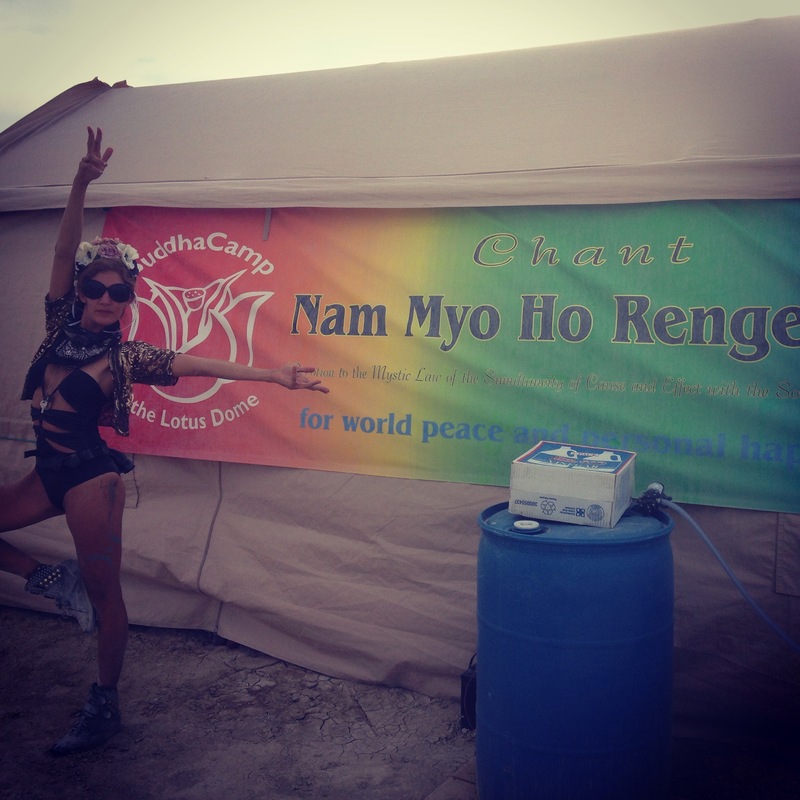 I am chanting Nam Myoho Renge Kyo, the Nichiren Buddhist sacred mantra, distilled from Buddhist scripture in the 13th century. Chanting Nam Myoho Renge Kyo is the most powerful tool I have to fulfill the mission I have to be a mindful mother, loving wife, and unique creator. It is not a magic bullet for making our wishes come true but rather a daily practice that allows us to access our innate Buddha Nature. That is….the true perfection that exists inside each of us and can lead to world peace. Longtime practitioners liken chanting to the act of polishing a tarnished mirror until it shines bright again. Nichiren Buddhism found me in the darkest time of my life so far. I was lost on all levels: broken up with a boyfriend, dissolved my business in New York, relocated to Los Angeles, and was spending far too many nights partying hard with surface friends. It was a very lonely time that appeared on the outside to be quite “fun” when in fact it was quite sad. At the time I happened to live with a longtime friend who had been chanting for many years. 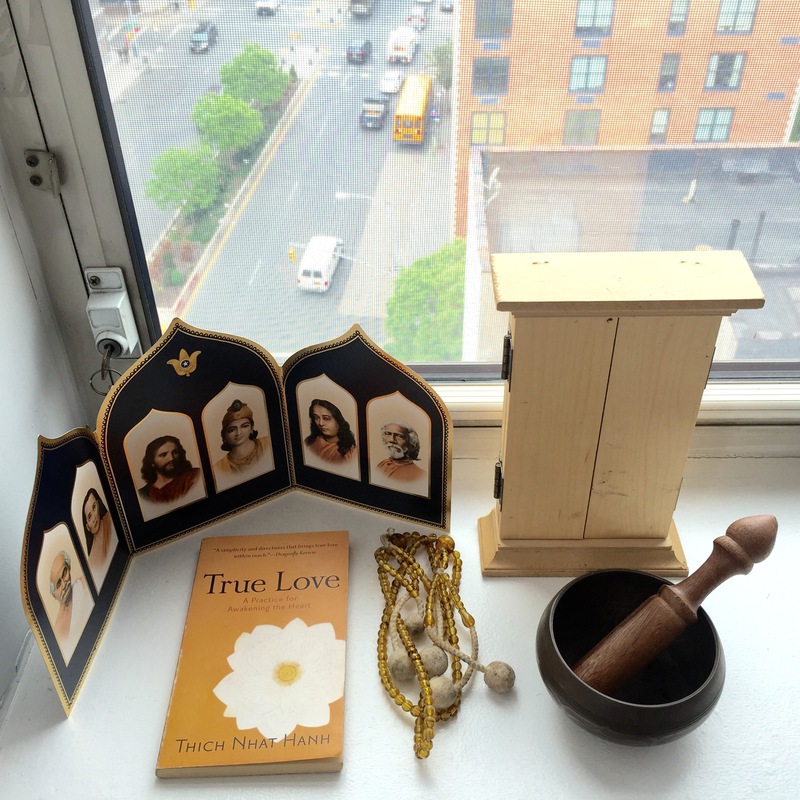 I never understood the practice until I saw her sitting at her altar every morning and evening and saw the correlation between her devotion and the light that shone from within her. 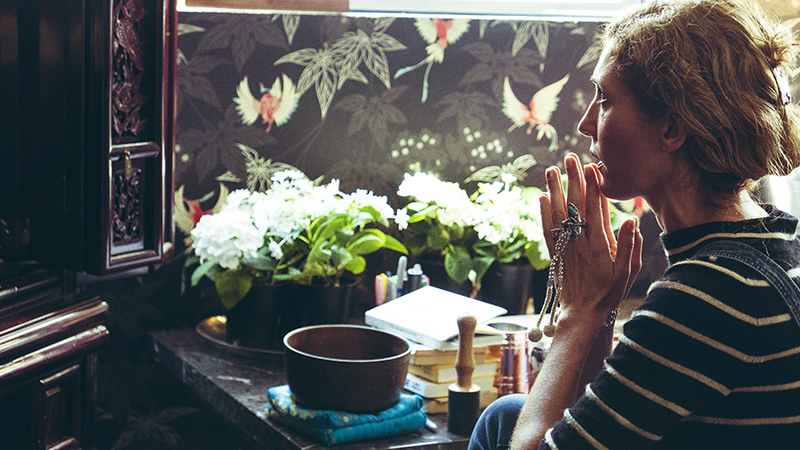 When we chant, we are tapping into our unlimited potential for happiness and activating our “Buddha Nature”. We are sowing the seeds forUnshakeable Happiness — meaning not contingent upon external circumstances. We are striving for ultimate victory over our challenges and waking up the potential we each have for our highest potential. I finally sat down and chanted for the first time when I realized that I absolutely had to transform the emptiness and pain inside of me into the true potential I have as a human being. It was the most tangible and powerful tool I had witnessed in my friend and it immediately felt like I had come “home” to myself. That was 13 years ago. NIchiren Buddhism is practiced by millions of people in countries all over the globe. 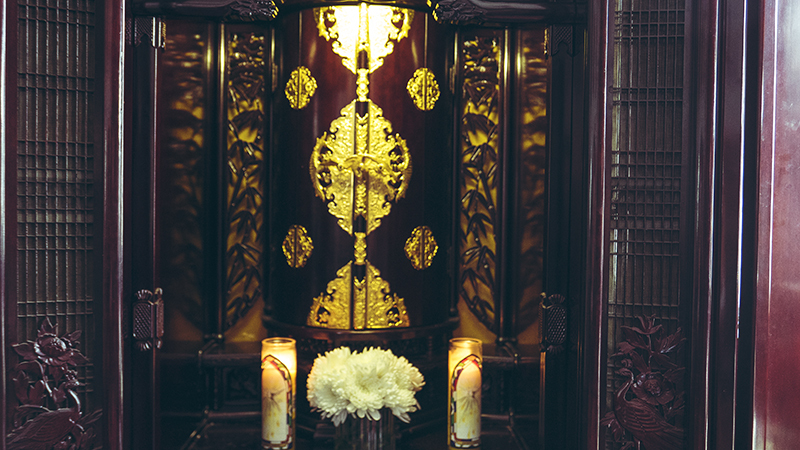 Practitioners have altars set up with a sacred scroll called the “Gohonzon”. This is NOT a deity outside of ourselves. It is a mirror of our soul. Thus we chant with our eyes open, looking at the scroll, which induces a type of meditative trance when combined with the repetitive vibration of chanting the mantra. For anyone who is challenged by traditional silent meditation (ME! ), chanting is a wonderful alternative for focusing your energy and creating a peaceful state of being. What I love so much about Buddhism is the focus on self-responsibility for our lives and our happiness and the belief that we are inherently perfect. Quite different from the ideas of “salvation” and sin that I was raised with in Catholicism! Meditation photos by Ziv Sade. I was wondering if there are any books you could recommend for someone who has always been intrigued by the Buddhist spirituality and want to learn more about what I can do within myself to help make me a better mother. One that, like you, want to reflect on the way our mothers raised us and do our best to not repeat the past. I was raised in a very religious home where I didn’t think I needed to plan for the future bc Jesus was coming soon and I feared that if I didn’t pray before I went to bed that if I die in my sleep I would go to hell. On top of all of that my father was murdered when I was 9 which forced me to become an extremely independent person. I had lost my dad and I was left with someone who was constantly critical and judgmental. Now that I am 30 and have a 2.5 year old that I can scarily see myself in every aspect of his personality, I really want to make sure the I am a present mother that won’t hinder him from being exactly who he is. I really relate to you and your parenting style/ dynamic. Being in the south it’s very hard to find like minded mothers. Thank you for sharing your story. I can’t wait to learn more from you. Buddha in your mirror is a beUtiful and informative book to get you started on the right road of tapping into your buddha nature 🙂 NMRK!! As a long time practitioner (40 Years) of Nichiren Buddhism, it is so inspiring to see you share (shakubuku), in a natural, warmhearted manner. Thank you for the being a true bodhisattva. Even more, it’s exciting to see buddhism shared on a Bravo series! I will send you mucho daimoku for your success, family harmony/love/unity and happiness.